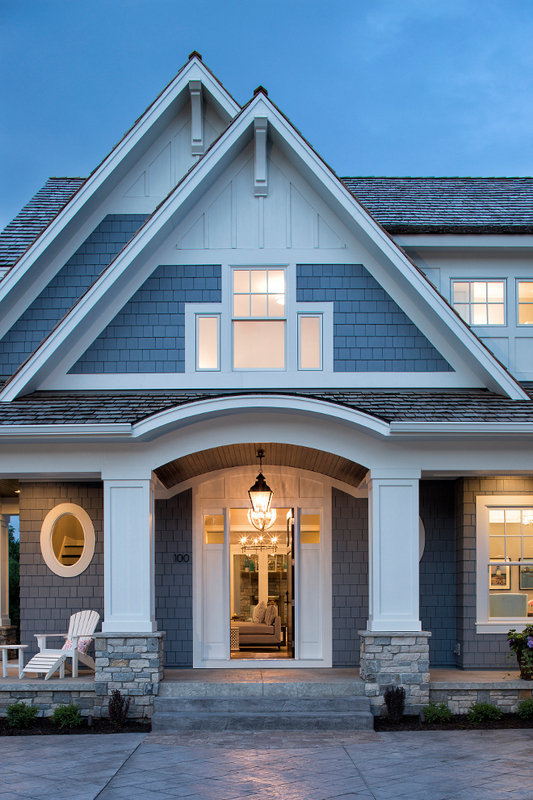 Located on a quiet street in Orono, Minnesota, this classic coastal cottage-style home combines perfect interior design with distinct architectural details. 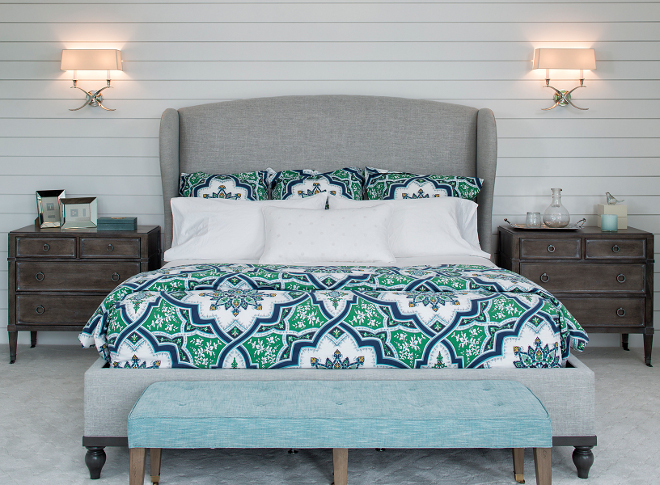 Here, the interior designer, Kristi Patterson, from Grace Hill Design, tells us more about this inspiring project. 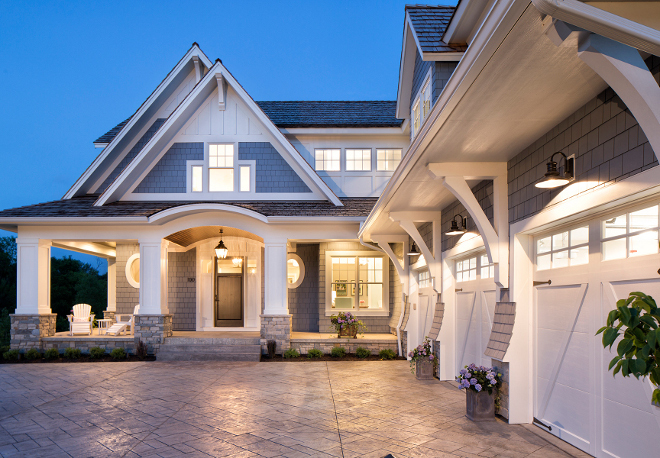 “This home was built for a growing family by Gordon James Construction. 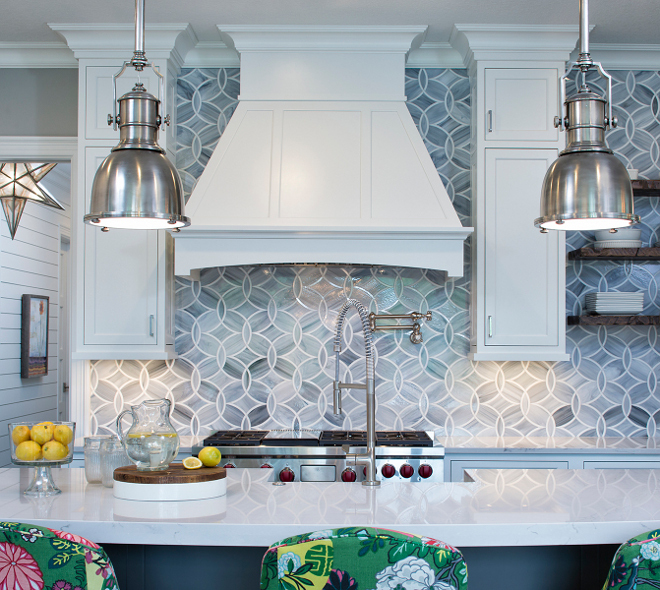 We worked with the builder and the homeowners from the beginning of the project, choosing all of the builder selections from lighting, tile, paint, cabinet design, hardware, flooring, stone, exterior, etc. The lighting all came from Grace Hill. 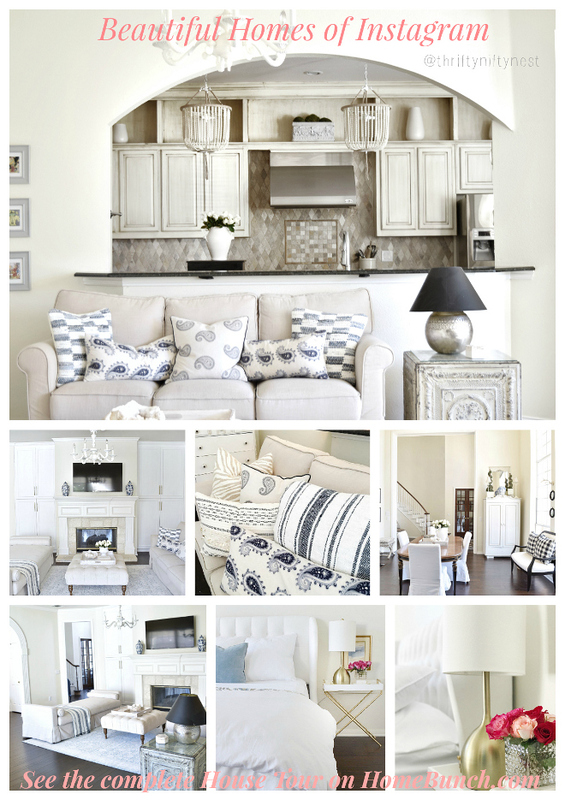 And, we also furnished and accessorized the home with items custom ordered for the client from Grace Hill. 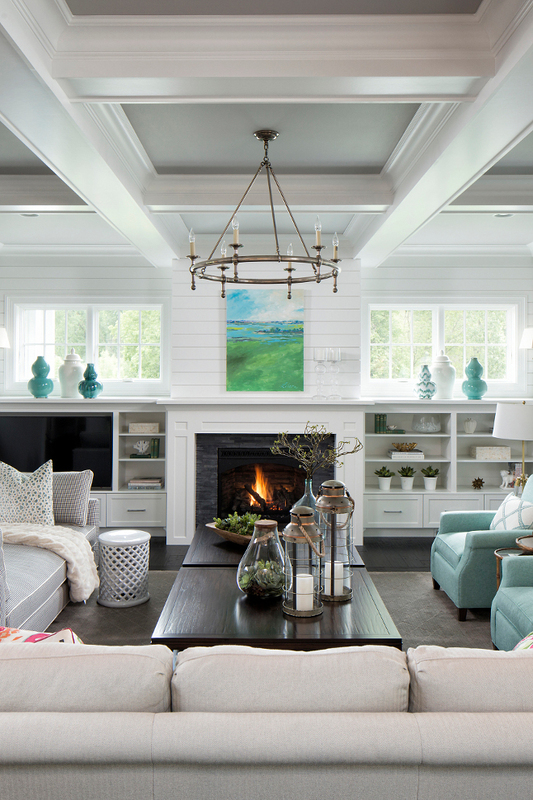 This cottage-style home feature some fresh design elements, such as grays & whites as the backdrop to coastal blue accents (rugs, pillows, some wall color, art). 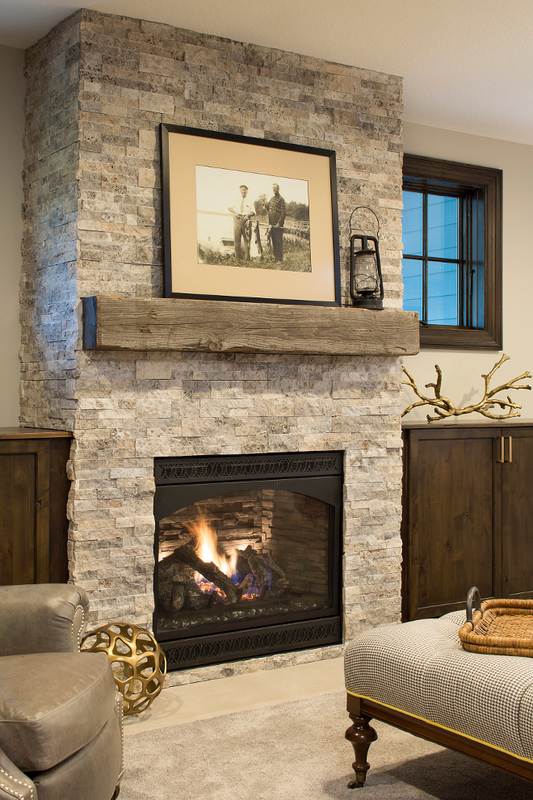 The connection to the outside was a key factor to the home’s design, as it features a 12-foot bifold door which completely pushes back to open the Great Room to an outside screen porch with a big stone fireplace. The home also features an inviting front porch and a large deck off the back for entertaining. It was important to the homeowner that we added a lot of warmth to make it a comfortable, inviting home. We brought in a lot of “aged” elements to contrast the crisp backdrop. The home features 2 large barn doors, distressed floors, rustic open shelving in the kitchen and pantry, a stained tongue and groove ceiling on the screen porch, and a dutch door to the mudroom. 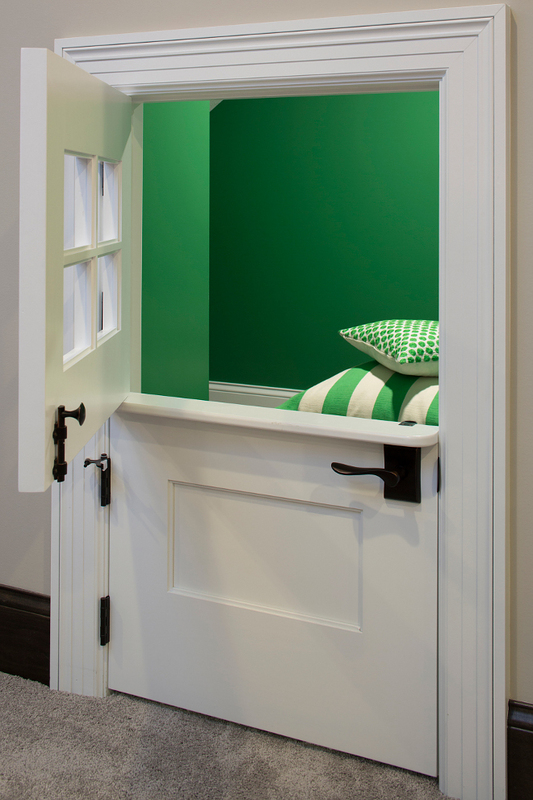 It even has a little kids’ sized dutch door to a play area under the stairs in the lower level. 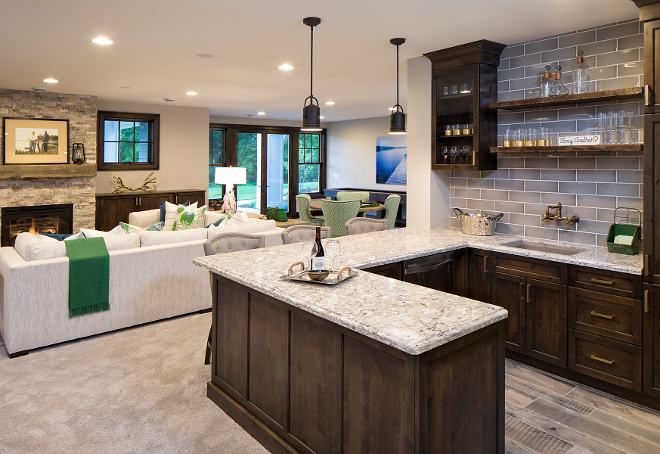 The basement also features a custom wine cellar, a full bar area, fireplace and barn wood wall, which makes the space feel cozy for entertaining. The lighting offers a mix of rustic, aged-looking lighting with some “glam” fixtures to avoid it looking to heavy. 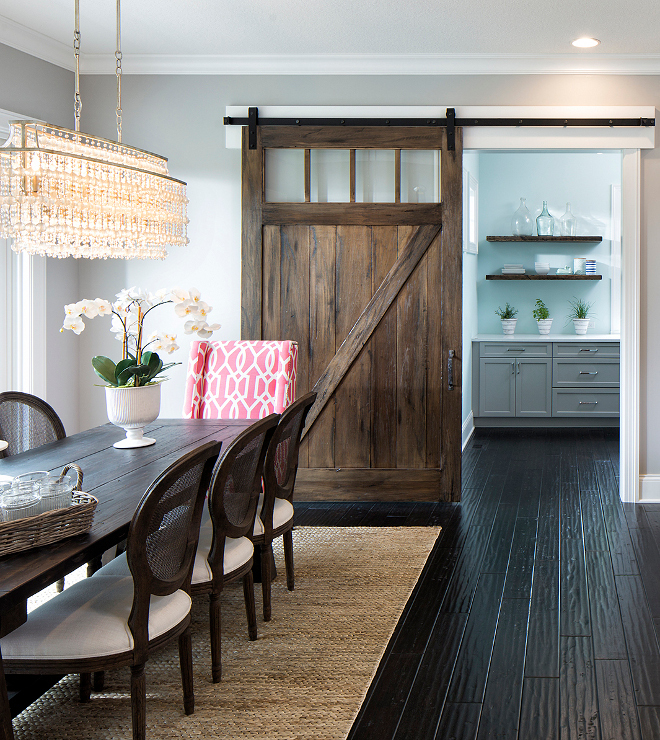 For instance, the lights over the kitchen island are very classic aged pewter pendants and we paired it with a crystal horizontal chandelier over the dining table that adds a big impact and some shine. The home also has some great features for the family, such as a large walk in shower with full body sprays and a rain shower faucet. 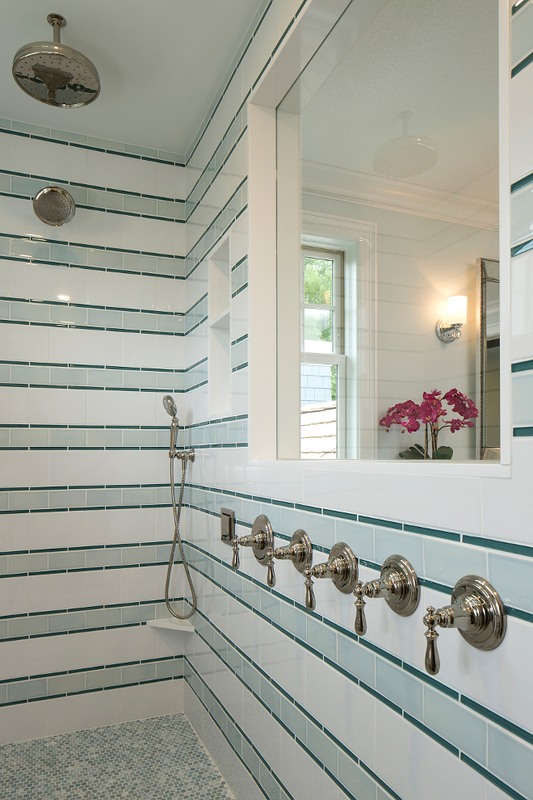 Because they opted to not have a tub in the Master Bathroom, we made the shower a focal point with tile laid in a striped pattern with a coastal color pallet. 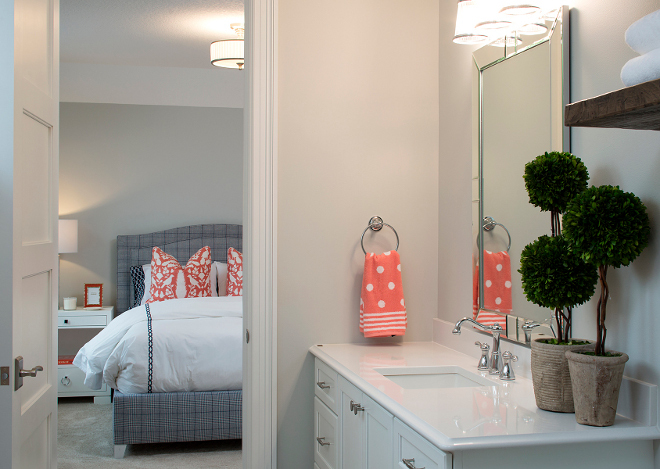 Take a look and take notes on paint colors and more sources. This is a home you will want to save and pin away! This home exudes beauty from every angle. Exterior lighting is from Quoizel. Garage Doors: Clopay Coachman Series with Trim Applied, SQ23 Windows in top section. The home features 6,022 square feet and a three-car garage. Don’t you just love that front porch? The measurement from the front corner of the porch to the back of the house is 59′. The pillars are 1′ 10″ square on a 2’10” square stone base and the exterior stone is Fountain Hills w/15% Blue River Variegated. 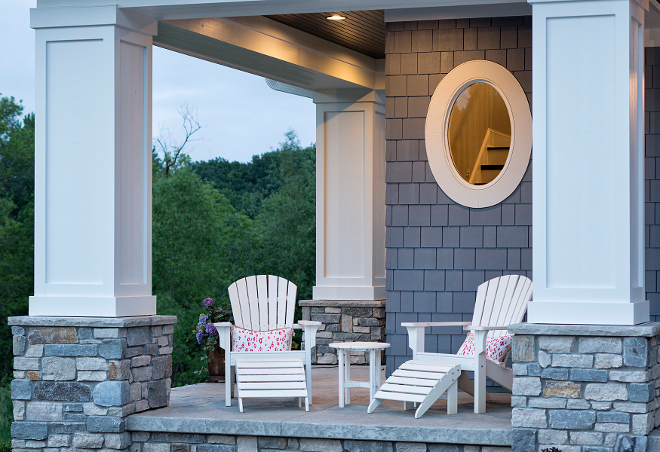 The exterior features James Hardie siding and trim. The trim color is Arctic White. 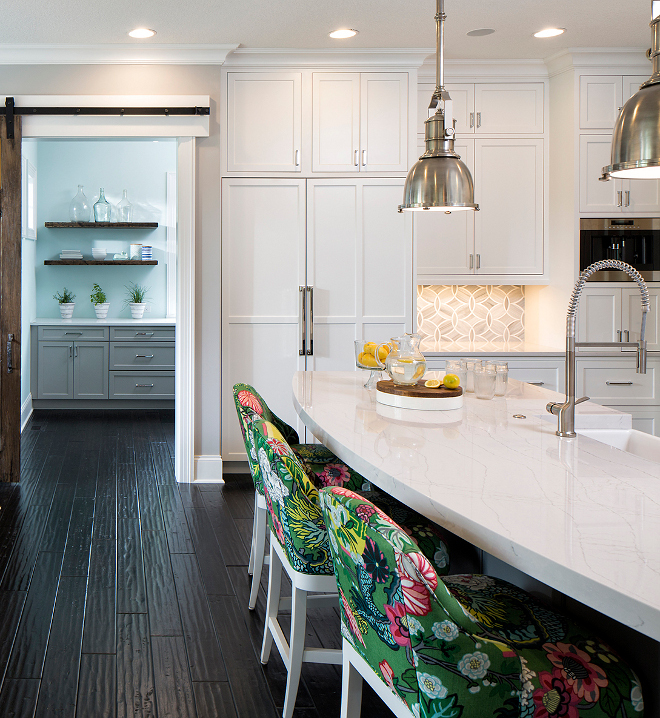 High-end appliances and a huge walk-in pantry make this kitchen a dream for everyday cooking and entertaining. Kitchen Island Dimensions: 9′ x roughly 5′ at arch. Paneled Fridge & Freezer: Wolf 24″ freezer with ice, 12.3 cft. storage, panel ready. LHD. Sub Zero 30″ refrigerator, 17.3 cft., panel ready. RHD. Kitchen lighting is E. F. Chapman Country Industrial Small Pendant. 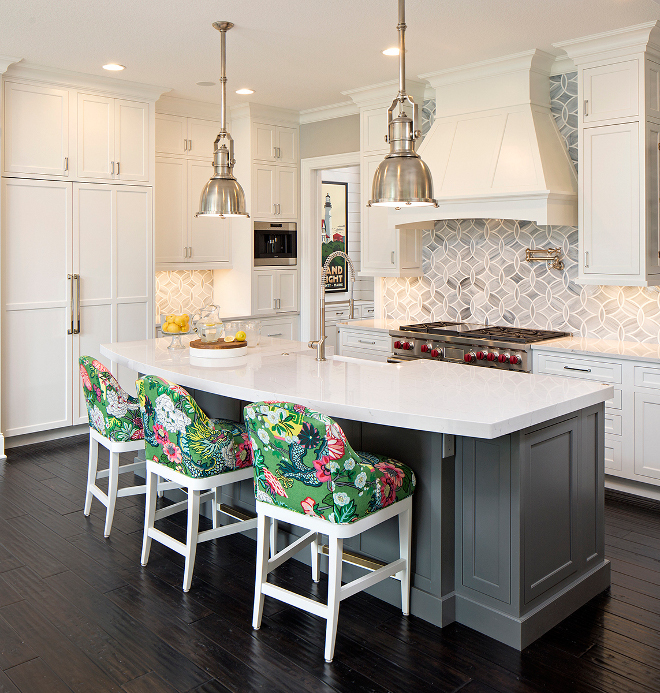 The charcoal grey kitchen island paint color is Kendall Charcoal HC-166 Benjamin Moore. 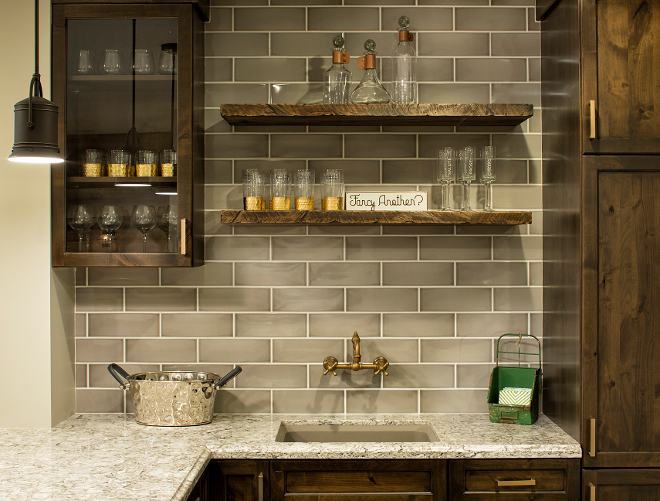 The kitchen features an intricate cut tile backsplash by Ann Sacks with rustic wooden shelves for open storage. 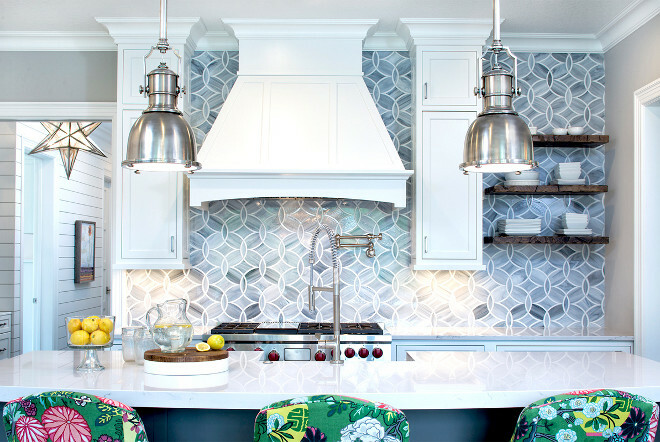 Tile is Ann Sacks Beau Monde Glass: Polly; Glass Tile Colors: Absolute White and Pear. 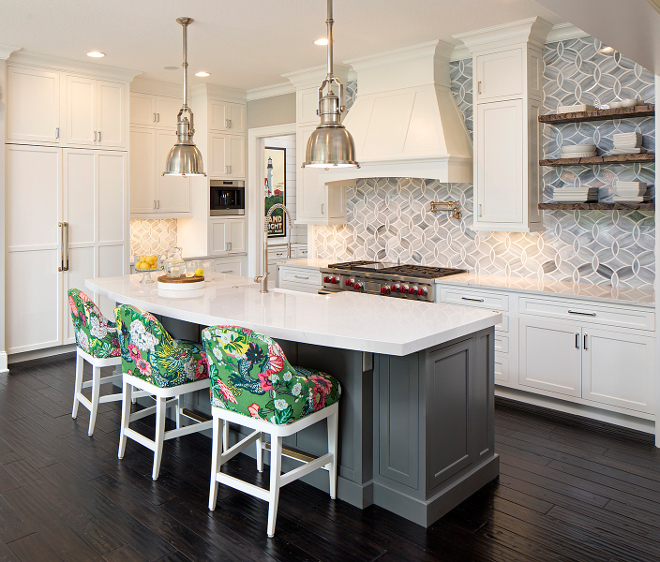 The perimeter cabinets were enameled in White Dove by Benjamin Moore. Barn Door: Wood Species – Knotty Alder. 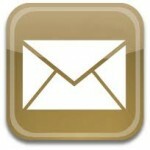 Overall Size is 4′ x 8′. 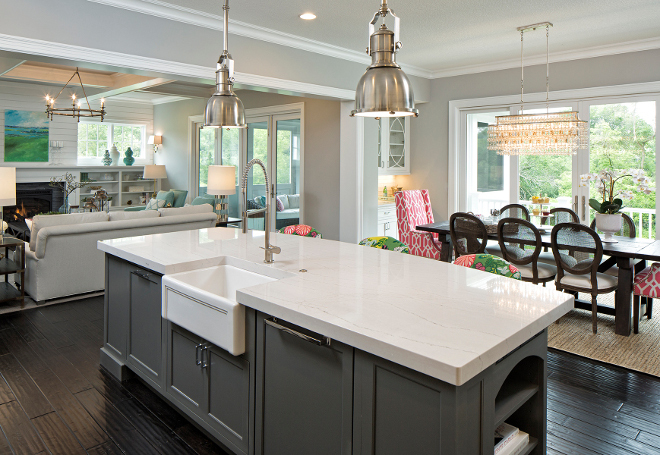 Kitchen features a marble-looking Quartz Countertop; Cambria’s Ella with Grand Summit Edge on island. 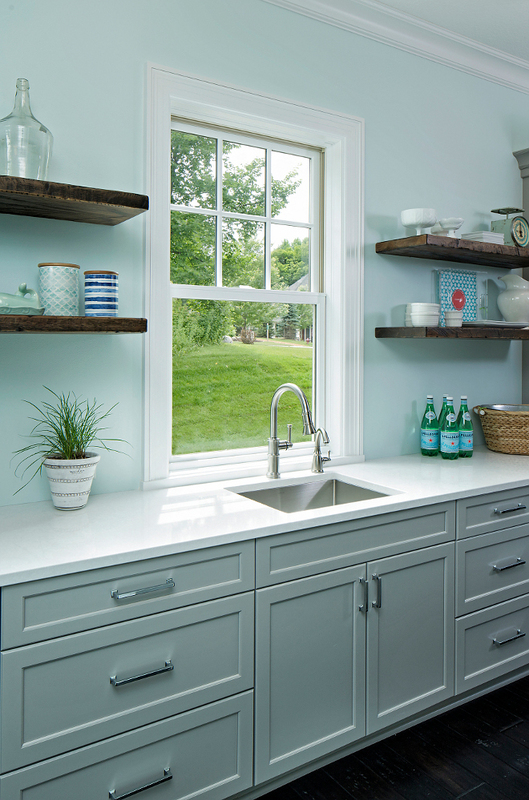 Perimeter countertop is Cambria’s Ella with Ridgeline Edge. The counterstools have Schumacher’s Chiang Mai Dragon fabric in Jade. Wall paint color is Silver Chain 1472 Benjamin Moore. 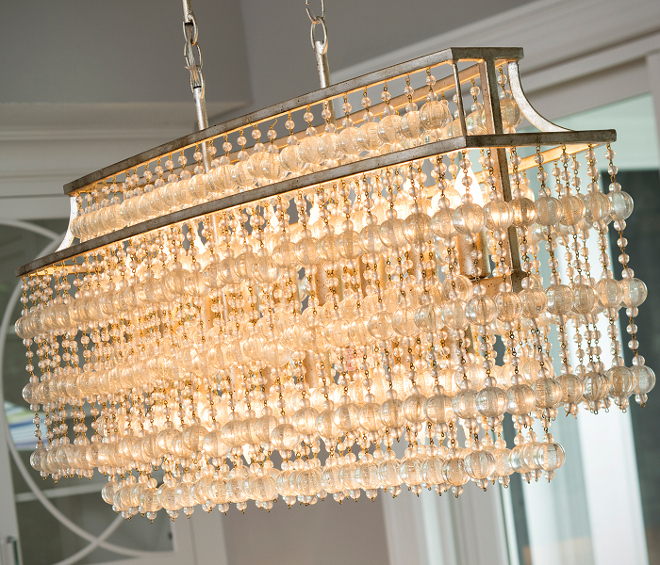 Lighting is Currey & Co 9864 Rainhill Silver Granello Linear Chandelier. Pantry wall paint color is Crystal Blue 2051-70 Benjamin Moore. The fabric for the 2 captain’s chairs at the dining table is a trellis fabric from Thibaut and the chairs were made by CR Laine – custom through Grace Hill. The walk in pantry is one of my favorite features because it is large enough to prep food and store everything you need to entertain. 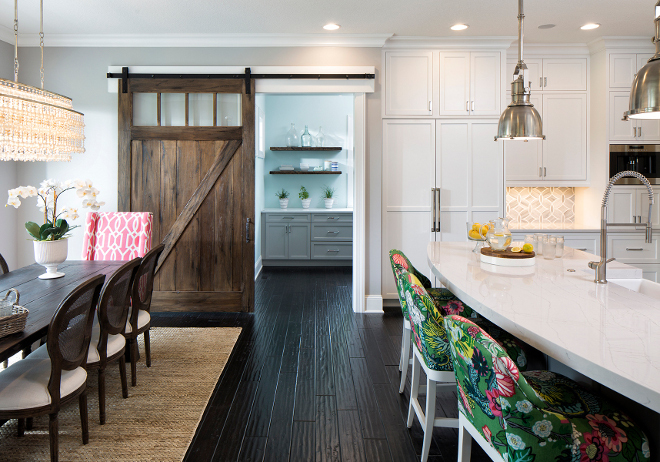 But, it also allows you hide the dishes after a dinner party by closing the big rustic barn door, leaving your kitchen island clear of the clutter until guests leave. 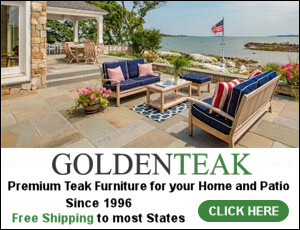 The grey shaker cabinet paint color is Coventry Gray HC-169 by Benjamin Moore. Faucet: Hans Grohe Axor Citterio single handle kitchen faucet, Steel Optic finish. 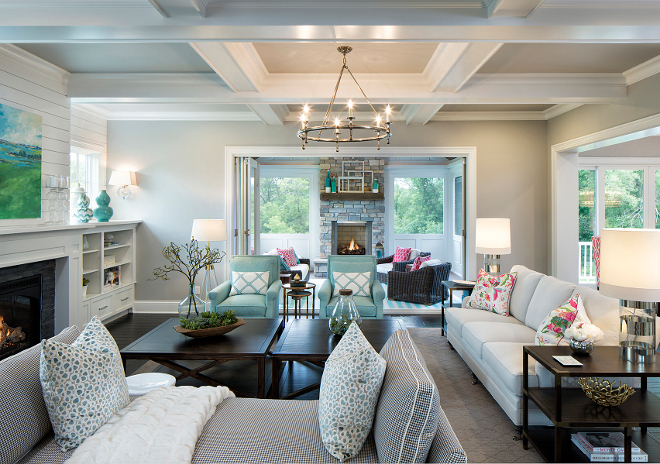 This inviting living room features shiplap fireplace, half wall cabinets, windows above cabinets and coffered ceiling. 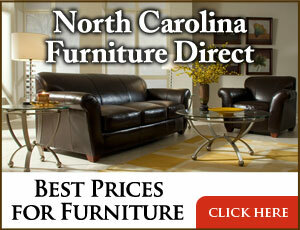 Furniture and decor are available through the designer. 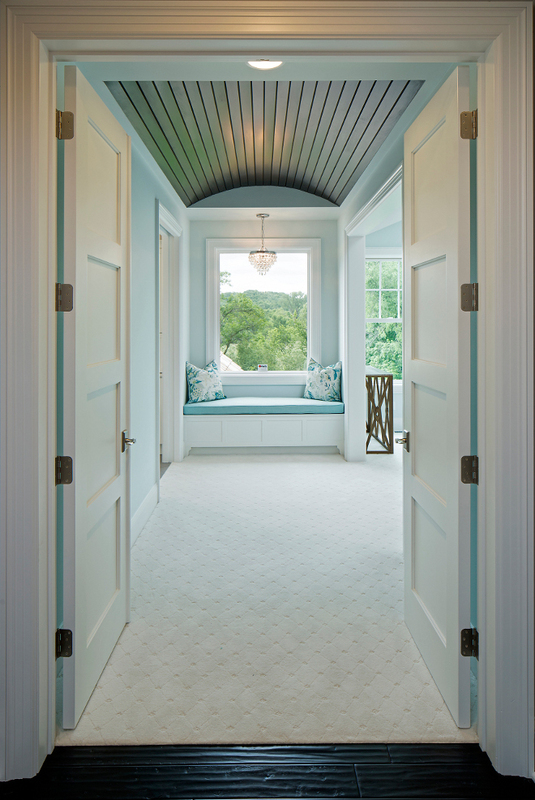 Ceilings are smooth within coffered ceiling. White enameled ceiling beams (Benjamin Moore White Dove) with Benjamin Moore Silver Chain 1472 on ceiling. The ceiling light is Chart House by E. F. Chapman Classic Ring Chandelier. A 12-foot bifold door extends the living space to a well-designed screened-in porch. 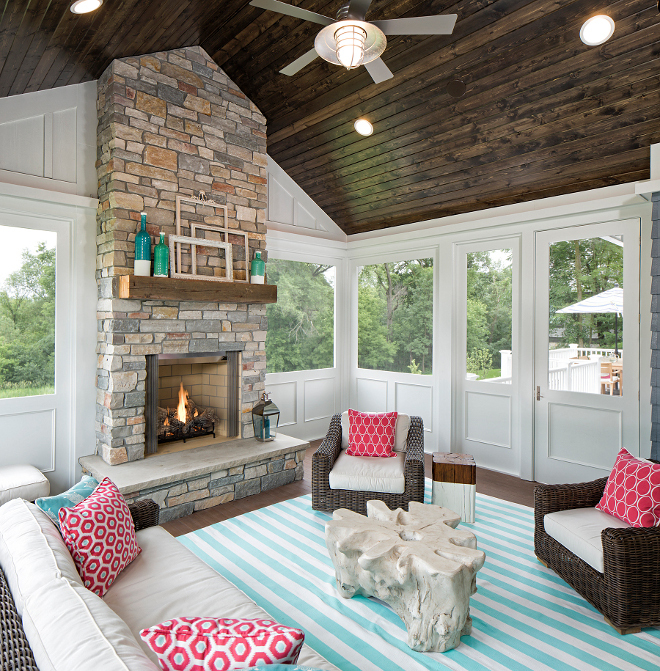 This summery and cheerful screened-in porch features stained T&G ceiling boards and a floor-to-ceiling stone fireplace. 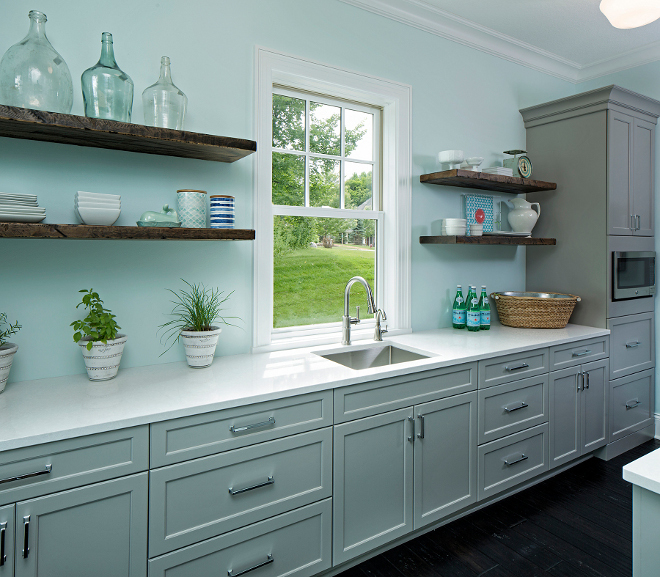 Aqua Cabinet Paint Color: Sherwin-Williams SW 6764 Swimming. Mirror and lighting are available through the designer. Hall lighting is Polished Nickel Darlana Lantern from Circa Lighting. Flooring: Engineered Hardwood: Provenza Antico – Tavern; Species: Hevea (Plantation Beech); Hand Scraped, Hand Sanded, Hand Stained; 5.5″ width. 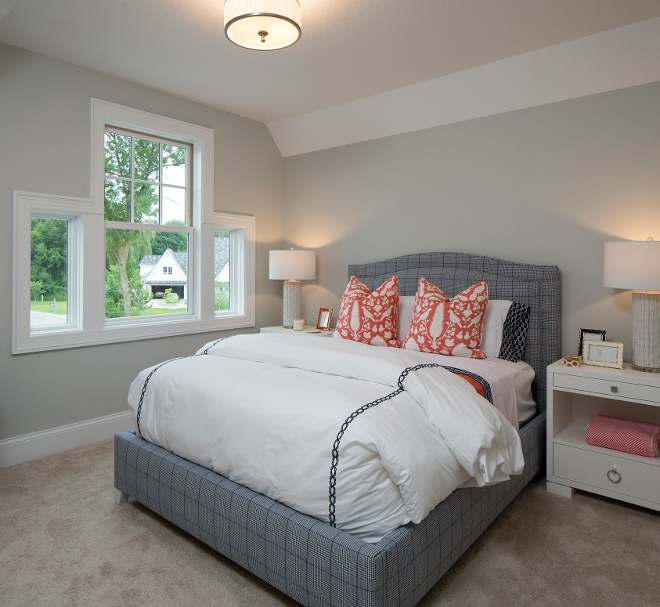 Double doors open to a master bedroom with stained coved ceiling and window seat. 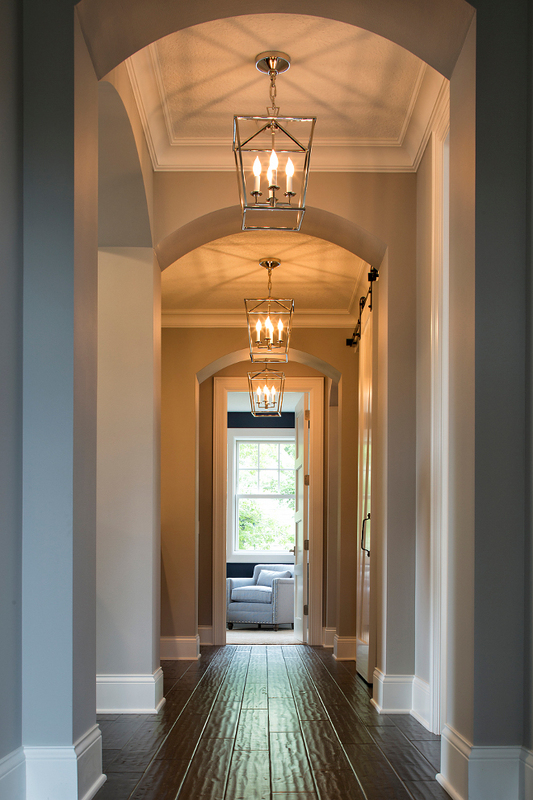 Flooring Details: Dixie Home – Genteel #5545 – Color: 16120 Kestrel. 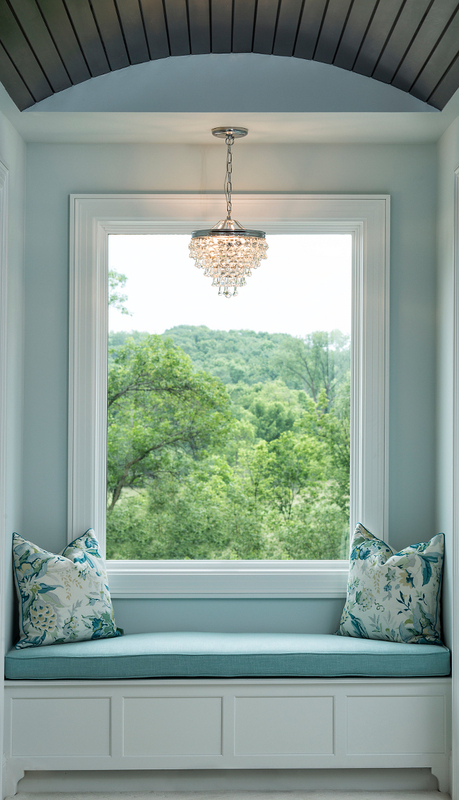 Wouldn’t it be wonderful to curl-up with a good book here? Take a look at that view! 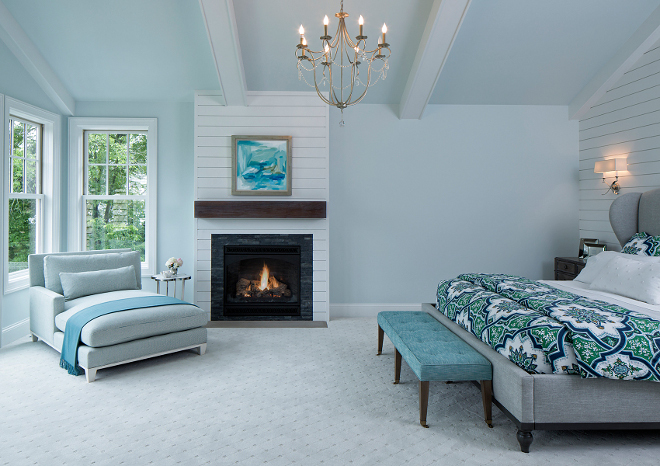 The master bedroom features a very soothing blue paint color; Whispering Spring 2136-70 Benjamin Moore. The shiplap accent wall is painted in Benjamin Moore White Dove. Sconces are from Circa Lighting. 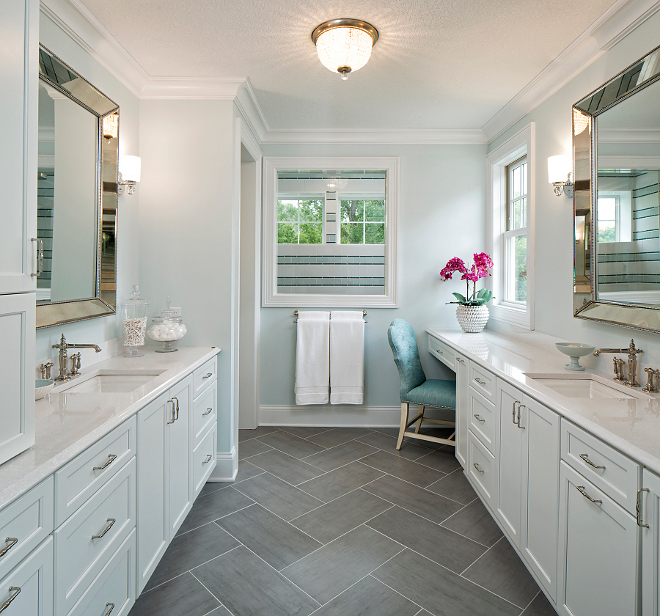 Bathroom flooring is from Ceramic Tileworks, Mon Modern Grey 12×24 laid in herringbone pattern. Wall color is Benjamin Moore Whispering Spring 2136-70. – 11 rows of 6″h = 66″h (white 6″x12″ subway). – 10 rows of 3″h = 30″h (light green 3″x6″ subway). – 20 rows of 9/16″ = 10″h (darker green glass pencil at 9/16″x6″). White Subway Tile:= Royal Mosa – 15 Thirty; extra white gloss #61213710; 6x12 as the white. Light Green Subway = Pratt & Larson Ceramics PF-36XX/3×6 Field; Glaze Color: R148. Pencil – AEC Hamptons Glass; Wave #GLSHAMWAVSLG; 9/16″ x 6″. from RBC Tile​ in Plymouth, MN​. 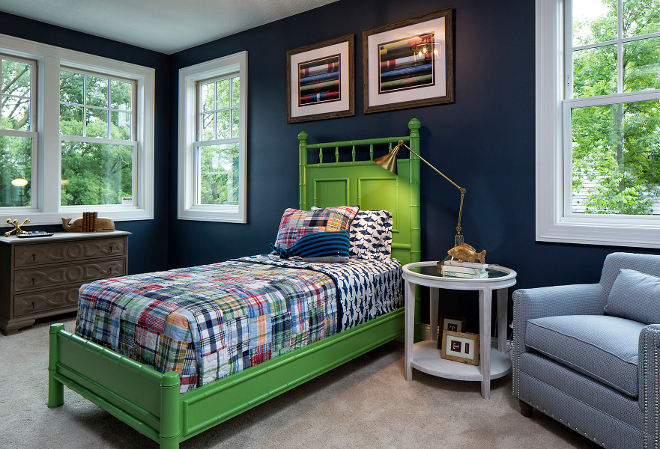 The boy’s bedroom paint color is Newburyport Blue HC-155 Benjamin Moore. Lovely! 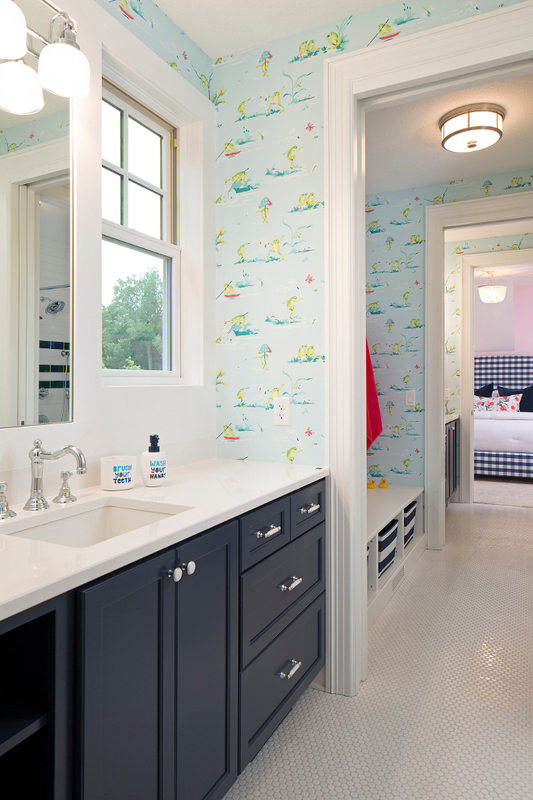 The designer tied the two kids bedooms together with a walk-through J&J bathroom featuring Thibaut “Froggy” wallpaper (Thibaut Resort Frogs) in light blue, navy, hot pink and greens. The cabinet paint color is Hale Navy Benjamin Moore. Paint color is Flush Pink 2081-70 Benjamin Moore. Doesn’t it look great with navy? Fresh! The guest bedroom paint color is Benjamin Moore 1479 Alaskan Husky. 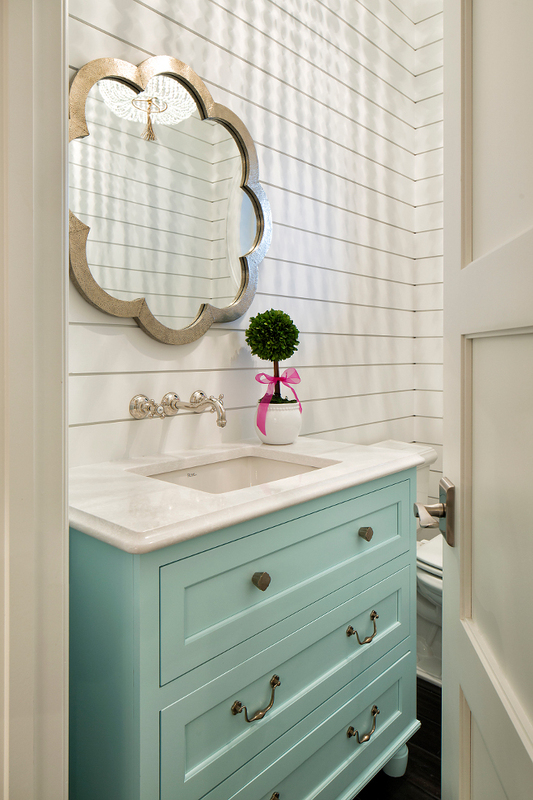 The guest bathroom features a white quartz countertop and a vanity painted in Benjamin Moore OC-17. Wall color is Benjamin Moore 1479 Alaskan Husky. 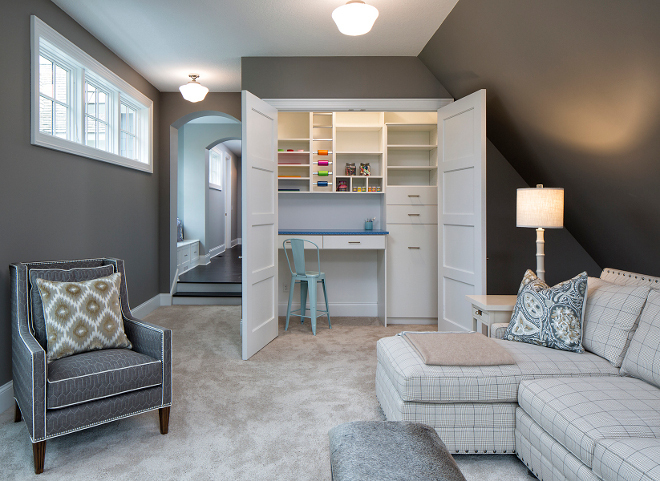 The bonus room features a closet craft room. I think this is a brilliant idea! The wall color is Benjamin Moore 1476 Graystone. Basement Paint Color: Revere Pewter HC-172 Benjamin Moore. 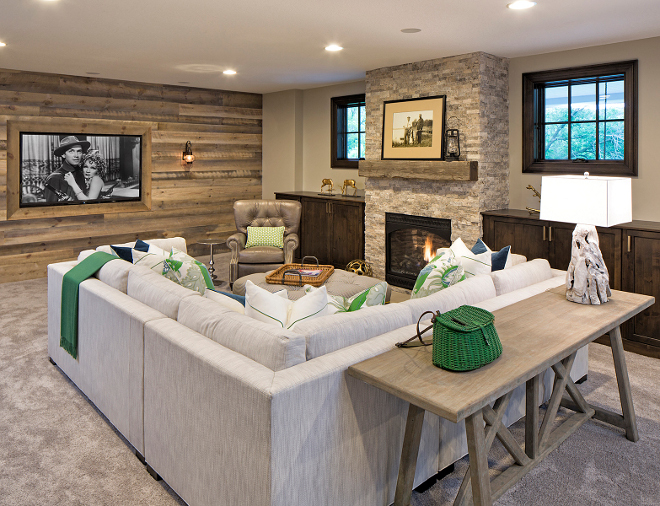 The lower level is an entertaining delight with a rustic wine room, bar area, TV area with a fireplace and game area—featuring rustic barn wood and stone. Isn’t this place perfect for entertaining? I love the kelly green decor found in this space. The cabinets were made of knotty alder wood. They were stained with a custom mix by the cabinet maker. Door Style – Kendall Panel, Full Overlay. Wood Species – Knotty Alder. The lower level kids’ play space under the stairs feature a tiny dutch door. The green walls are painted in Grassy Fields 2034-30 Benjamin Moore. Isn’t this a beautiful wine cellar? 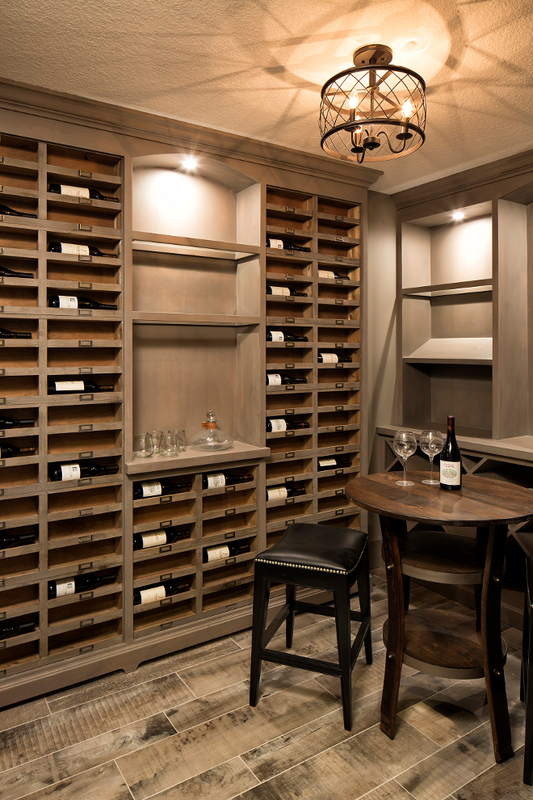 I love the custom wine shelving. Flooring is a wood-looking ceramic tile. Lighting is from Quoizel. 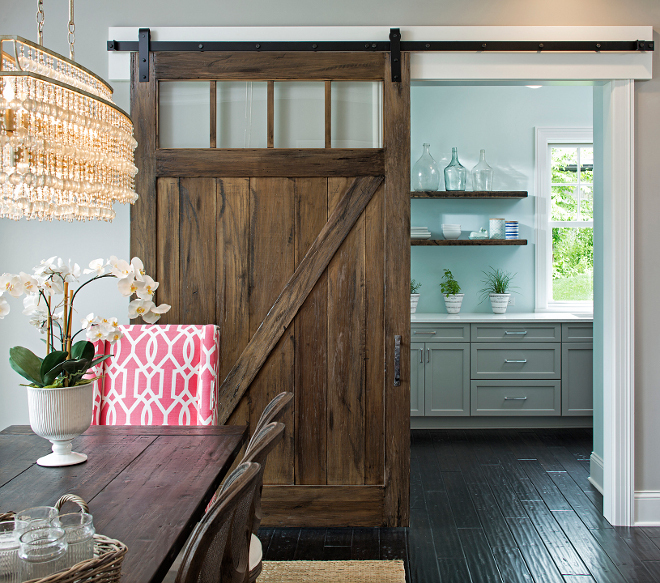 A Dutch door leads to the mudroom. Wall paint color is Benjamin Moore Silver Chain. 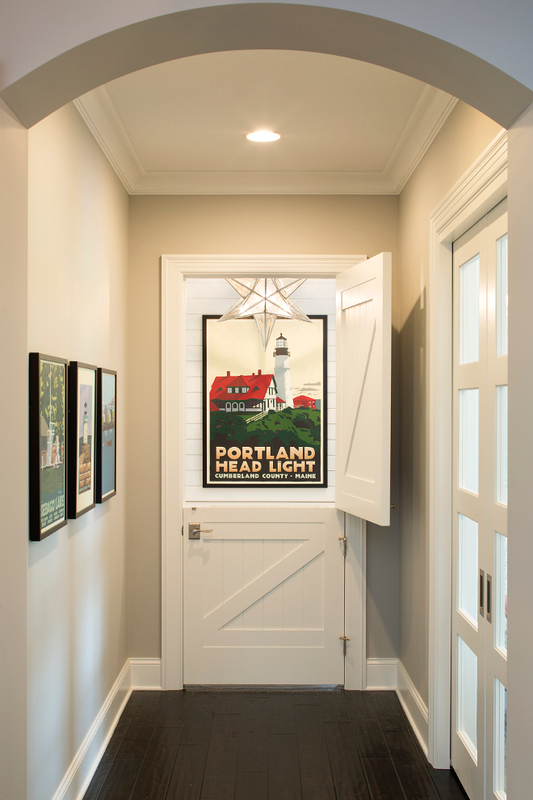 Dutch Door and trim paint color is Benjamin Moore White Dove. Lighting is Circa Lighting’s Moravian Star. 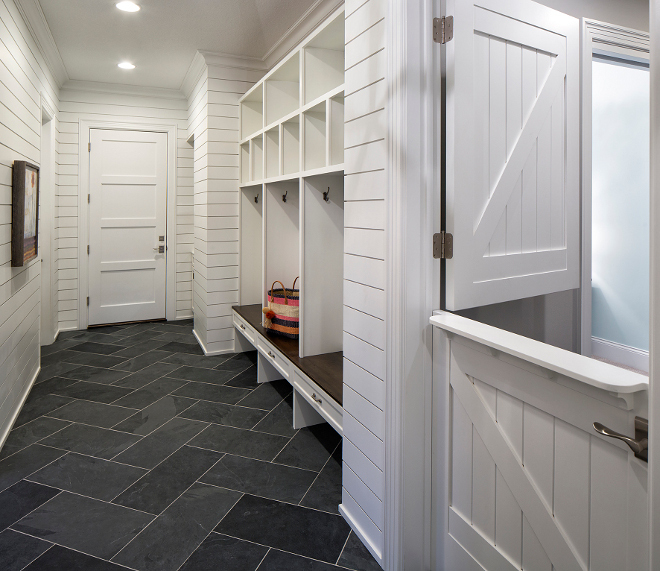 The mudroom features custom lockers, shiplap walls and Bluestone floor tile laid in a herringbone pattern. What a practical space! The exterior paint color is Sherwin Williams SW6249 Storm Cloud. According to the builder, “the inspired architecture pays homage to the graceful tradition of historic homes in the area, yet every detail has been carefully planned to meet today’s sensibilities.” I couldn’t agree more. 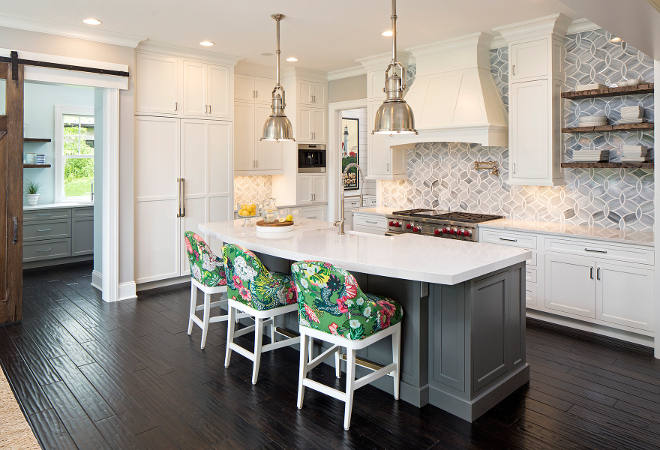 Traditional Coastal Home with Classic White Kitchen. 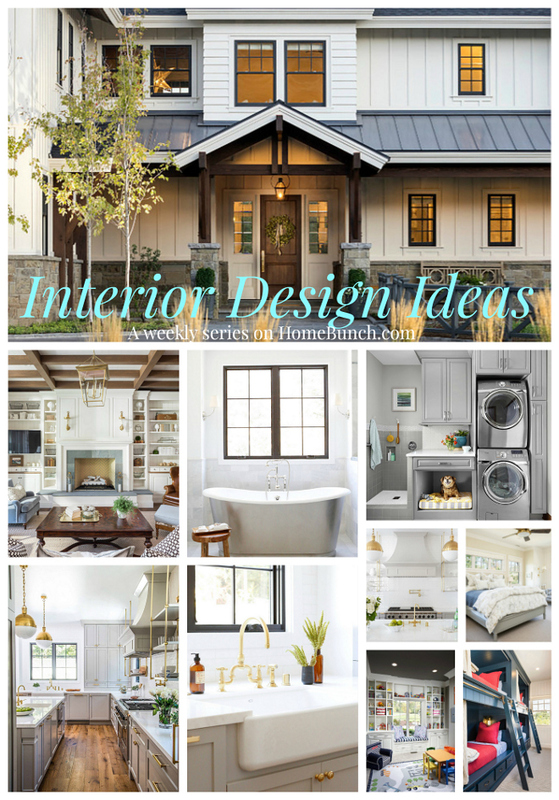 Weekly series with the newest interior design ideas. So, how are you doing? Is everything good in your life? If there’s one thing I have learned is that, the more grateful we are, the more reasons to be grateful we will have. Get out there today and look for the good things that will happen throughout your day. Count the Blessings… each and every day of our lives are filled with them! Thank you all for being here today, my friends. That fireplace stone is exactly what I’ve been looking for. Do you know where this stone was purchased ?